There is no small degree of absurdity to predictions, particularly when it comes to providing a single win total for teams that play a 162-game schedule. This absurdity is frequently noted by Ben Lindbergh as he is extracting said prediction from the Effectively Wild preview podcast guests, as well as by a number of the guests themselves. Projection systems aren’t yet sentient (although I look forward to Skynet’s pre-apocalyptic run as an MLB projection system) so they tend not to comment on such things directly. They do, however, project a range of outcomes, so the number you might see on the projected standings page of Baseball Prospectus or FanGraphs is simply an aggregation that obscures the vast spread of outcomes their projections produce. In other words, before I embark on this annual project which is based around those single win total predictions, just remember that this isn’t really how any of this works. Before the breakdown, here’s a reminder of what this feature is about. I compile the win total predictions and projections from a number of sources, compare the range of different outcomes they provide, and return at the end of the season to find out which was the best set of win totals, or perhaps more accurately, the least wrong. Below is a recap of the contenders and the abbreviations I’ll use in the various tables. You can find out how they all fared last season in detail here. PECOTA (PEC): Baseball Prospectus‘ projected win totals based on their in-house projection system. First place by RMSE, second by MAE in 2017, after two disappointing years well behind the winner. FanGraphs (FG): The FanGraphs Depth Charts projected totals, which are a combination of the Steamer and ZiPS projection systems, with an additional playing time adjustment applied by FanGraphs staff. Top two in each of the past three seasons. Davenport (Dav): Totals based on Clay Davenport’s projection system, with Clay’s own playing time estimates. Only included last two seasons, yet to beat the other two projection systems. Banished to the Pen writers (BttP): Predictions from each of our writers from our season preview series. Number one by RMSE in 2016, fell behind all but the EW guests in 2017. Effectively Wild guests (EW): Predictions from each of Effectively Wild‘s team preview podcast guests. Victorious in 2015, one of the worst sets since. Composite (Comp): The average of the five projection/prediction sets above, with the BttP/EW sets adjusted down to add up to 2430 wins so they are not given extra weight. The most effective predictor in terms of overall rank in 2017, otherwise – unsurprisingly – middle of the pack. Adjusted PECOTA (APEC): A modified PECOTA prediction set, based on EW listener responses to a preseason over/under poll using the first PECOTA release. Each PECOTA total is modified by up to ten wins, based on the net total percentage of listeners taking the over/under; for example, if 70% of listeners took the over, 20% under, and 10% the push, the PECOTA total would be moved up by 5 wins. Beat PECOTA in 2016, fell behind in 2017, so the score is currently 1-1. Last year, I may have tried to influence the predictors by very explicitly stating that they are collectively way too optimistic, handing out far more than the 2430 possible wins. This seems to have worked to at least some degree on the writers here at BttP, who combined for 2462 wins, comfortably the lowest mark in the four years of this prediction review. It does not seem to have affected the Effectively Wild guests, however, who continued to be incredibly optimistic. I’m willing to entertain the notion that this particular group of people is slightly less likely to have read last year’s post. They arrived at 2497 wins, not quite matching their all-time high of 2504, but this marks the third year out of four that they have been around the 2500 win mark. Their low point was last year’s 2485. Only the Marlins and Tigers were predicted to win fewer than 70 games; only those two, the Royals and Reds were lower than 75. 11 teams were predicted to win 88 or more. This seems like a lot. It’s possible that for at least some of the guests, there is some pressure to be optimistic about the team when it is their day-to-day job to cover them, whether that pressure is felt consciously or not. I suggested last year that the preseason is a time for hope and optimism, when writers and reporters are looking for positives about the club. There may also be an element of it not going down particularly well with a fanbase if a team’s beat writer or broadcaster is negative about the team’s chances. That doesn’t apply to some of these guests, of course, but many are in the business of constantly covering the particular team they were on the podcast to talk about, and that also comes with a particular relationship with the fanbase. I may be missing the mark here. All we can say objectively is that once again, the EW guests have been incredibly optimistic. With every passing year of this review, it seems more improbable that the group could ever collectively predict fewer than 2430 wins. Let’s move on to the fully sortable, mathematically impossible divisional standings. It’s another division title for the Dodgers by the estimation of every system. Behind that it’s something of a mess, with the Diamondbacks slightly favoured to be the second place team, although both Davenport and EW guest Jesse Spector both put the Rockies in second place. The possibility of a Giants bounce-back seems to be fading with every new injury concern, so Grant Brisbee’s high of 84 from several weeks ago now looks more hopeful than realistic. The Padres are possibly on their way to being a good team. They aren’t there yet, and Davenport – which tends towards the extremes more than the other systems on the whole – thinks they’re truly awful, a full 16 wins behind the 75 from Dennis Lin of The Athletic. Another comfortable divisional win here, as no set has the second-placed team fewer than six wins behind the Cubs. Sahadev Sharma leads the way among EW guests in the National League with his 99-win prediction. The Cardinals are not behind Milwaukee in any of the five sets, although it’s close in the estimation of all but FanGraphs. The Pirates have a standard deviation of less than a win, the lowest of any team this year, and the Reds aren’t all that far behind in terms of agreement. The NL is not that surprising, is it? There’s a little more caution with the Nationals here, although that hardly makes a difference when their divisional rivals are projected to be so mediocre. The rejuvenated Phillies edge out the Mets in both PECOTA and Davenport’s standings, yet are far behind in the other three, particularly with Anthony DiComo’s 88-win prediction for New York. It’s another small spread in fourth place for Atlanta, while the disagreement about the Marlins is simply whether they will be very bad, or incredibly bad. The human totals tend towards the latter. Spot the team that won 100 games and the World Series. Houston’s smallest lead by any of these sets is 12 wins from Davenport. The Astros not winning this division would be one of the biggest upsets we’ve ever had in this series. The Angels have just about risen to the top of the remaining contenders, although PECOTA isn’t really buying it, and on the whole there’s just a lot of mediocrity in this division. It’s not that hard to envision almost any combination of the teams from second to fifth, although a last-place finish for Los Angeles with the best player in baseball on the roster would likely qualify as a shock. Another unanimous division winner, although Cleveland’s margin of victory is startlingly small in the EW column, thanks to a rather reserved prediction from Pete Beatty and contrasting optimism from BP EIC Aaron Gleeman. White Sox broadcaster Jason Benetti also got in on the enthusiasm, relatively speaking, with 75 wins comfortably the high point on Chicago. While no set suggests the Royals are good, they do all think they’ll be better than PECOTA does. The Tigers are a not-quite-as-bad version of the Marlins, it seems. We’ve saved the real divisional race for last. The Yankees edge the Red Sox 3-2 across the five sets, Boston assisted by Alex Speier’s monster 105-win prediction, the highest since I started tracking these. Speier was the only person to correctly predict a win total last year, so if he gets this right, start asking him for betting advice. The Yanks are still a 92-plus win team across the board and the clear number one wild card if they don’t win the division; likewise for Boston, without quite the same degree of optimism from PECOTA. The Jays are in that second wild card mix without getting anywhere near the top two. Finally, PECOTA likes the Rays more than the rest of the sets, and the Orioles less. Some things really never change. In mid-February, 131 Effectively Wild Facebook group members once again responded to the PECOTA over-under poll mentioned above. The standings in question were based on the original run of PECOTA and taken from the Baseball Prospectus projected standings page on February 15th, so that’s why there are some differences between the numbers above and those in the table below. This year’s most popular over was the Angels, at a massive 92.4%. PECOTA’s initial total of 80 has actually gone down by one win since then. This 89-win APEC total is by far the most positive Angels projection. There were also strong overs on the Red Sox at 87 wins and the Nationals at 89, so they turn into 94 and 96 win teams respectively in the APEC projection. At the other end, it was yet again the Rays who were the overwhelming pick for the under, with just over 90% of listeners taking Tampa Bay to win fewer than 84 games and just over 5% doing the opposite, turning them into a 76-win team. No other team was remotely close, but Pittsburgh and the Yankees tied for second on 75.6% under, with the Marlins right behind despite PECOTA’s joint-lowest prediction of 66 wins. This year’s most confounding teams were the White Sox, a team with a very slight lean towards the under at 73 and the highest agreement percentage of 27.5%, and the Blue Jays, with an almost exact split between over and under and another quarter of respondents agreeing. The Angels were also the most popular pick for team most likely to outperform their projection with 37 votes, followed by the Brewers at 19, despite the fact that Milwaukee was only the sixth-most popular over choice. For the under it was – you guessed it – the Rays, although it was closer than might be expected, with 28 votes to the Giants’ 21 and the Yankees’ 20. When asked to pick the divisional winners and wild card teams, there weren’t many surprises. The Dodgers took 128 votes out of 131, the Nationals 127, and the Cubs 122, with only the Brewers topping even 5 wins as a potential alternative to the favourites. Cleveland were the closest to unanimous division winners at 129 votes, with Houston at 124 and even the Yankees reaching triple digits at 101, leaving the Red Sox with just 30 believers. Red Sox-Angels was considered the most likely AL wild card matchup, with 86 votes apiece for the first and second spots respectively. 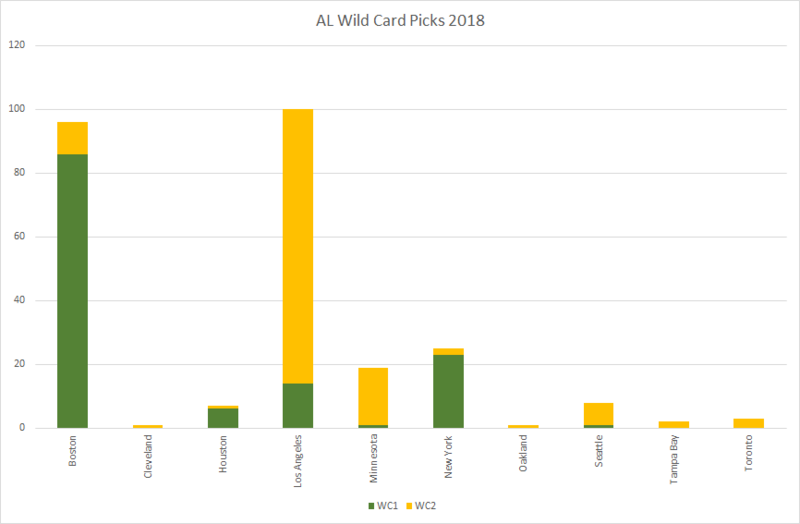 Los Angeles led the way with 100 wild card picks overall. Some less popular picks included Seattle (7), Tampa Bay (2) and Oakland (1). The full results are displayed in the graph below (click to expand). 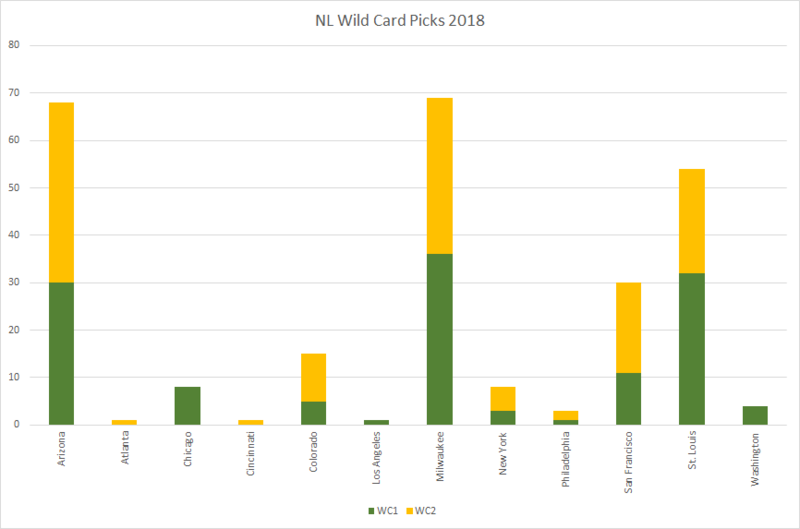 The NL was a much more balanced affair, with the Diamondbacks, Brewers, and Cardinals all getting at least 20 picks for both spots. The Giants also hit double digits for each. Arizona visiting Miller Park comes out as just barely the most popular wild card game. Finally, I asked if the league home run record, shattered last year to now sit at 6105 home runs, would be broken again. The result was incredibly close, with the no group just edging out yes at 52.7% to 47.3%. Perhaps the community thinks that the home run environment will at least remain static, and possibly even decline with a humidor in Arizona, and that those players gaining an advantage by modifying their swings have already emerged to squeeze all the benefits out of the juiced ball. Or perhaps I just asked a really random question at the end of this poll that people didn’t spend a lot of time thinking about. Last but not least, here’s the final collection of every single win total prediction and projection that have been discussed here, along with the standard deviation and composite of the five main sets. All of these will once again be reviewed at the end of the season, to ensure that no dreadful prediction or projection passes by without comment. See you in October.